I have a game I play with myself to see how long I can go between grocery shopping trips. 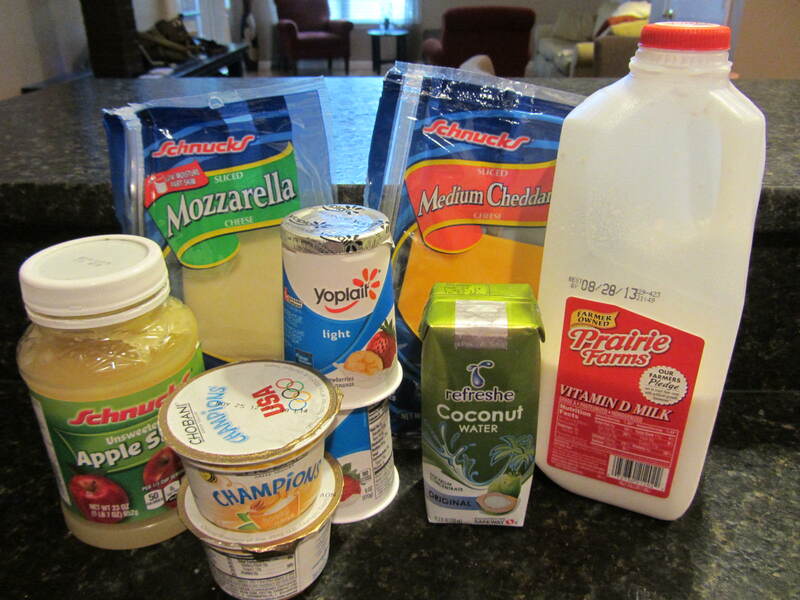 I started my Clean Out the Pantry Game a few years ago when I realized that I kept going to the grocery store and buying more of the stuff I eat all the time, while I had things in my pantry that I never seemed to use. Keep in mind that I live by myself, so every single thing in my pantry is something I thought I wanted to eat when I bought it, but it just never makes the top of the list for what I feel like at the moment. My pantry game goes like this. When I realize that I’m starting to get low on things and I really should go to the grocery, I sometimes decide to purposely wait in an effort to use up the odd things that have been in the pantry for a long time. I start searching online for creative ways to use these ingredients without going shopping. Sometimes I will allow myself a minor shopping trip to pick up eggs or onions or pasta so I can keep the game going for longer. I’m at that point now. My shelves are almost bare of the essentials to complete a meal. I know my pantry doesn’t look empty, but almost everything are stock items like spices, oil, vinegar, flour, oatmeal and such. And yes, I know I need to take out the trash and recycling. 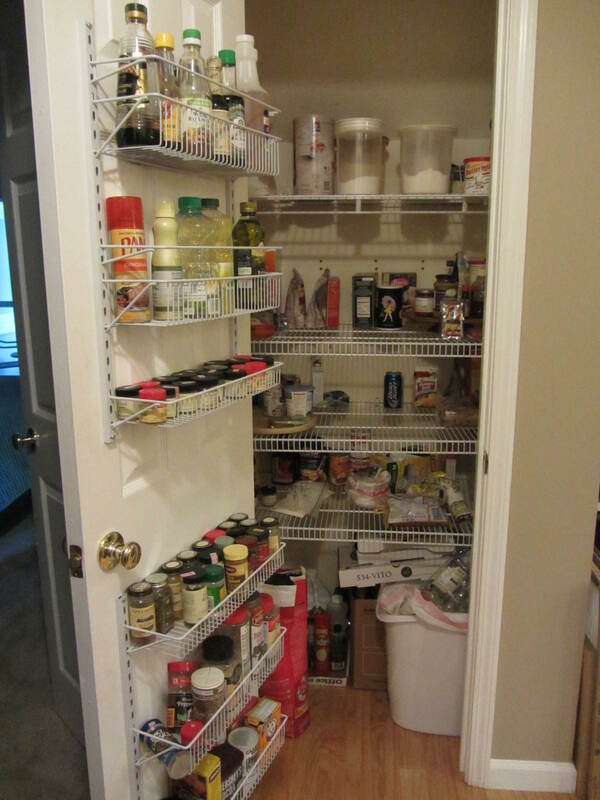 I need your help in coming up with creative ways to use up the odds and ends in my pantry. Don’t worry about if I’ll have all of the ingredients, I’m willing to go out and buy them in my next shopping trip. This picture shows almost everything in my pantry that isn’t what I consider pantry basics. My freezer is even more empty. 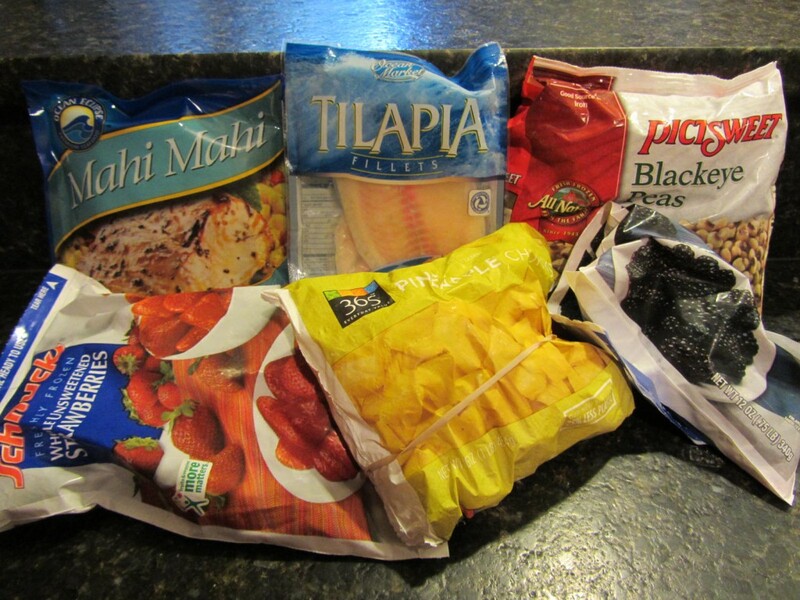 All I have in it is some frozen fish, fruit and black eyed peas. 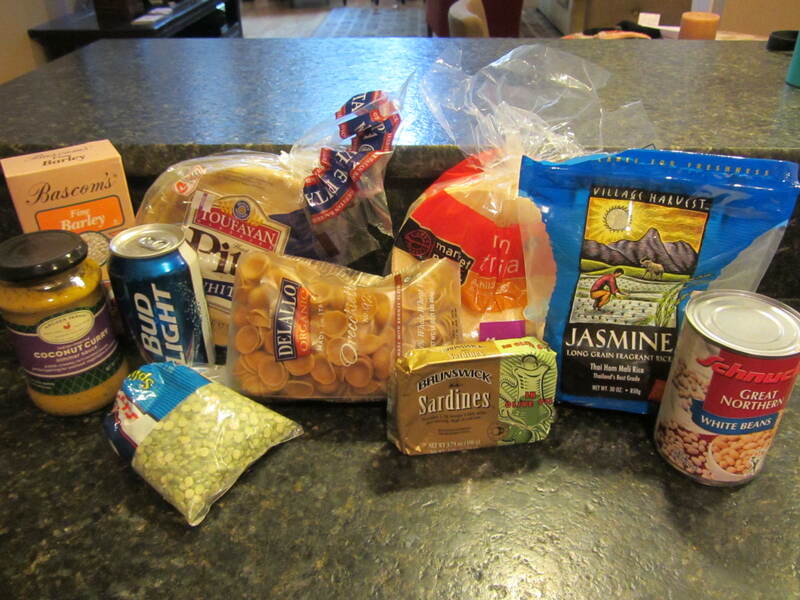 Plus some frozen hamburger buns and garlic that I didn’t pull out for the picture. Normally I would keep my game going without going to the store, but it’s almost impossible for me to cook without eggs, and I used up the last one last night. Other than my condiments, some leftover chicken salad and baked beans, this is ALL that was in my fridge. Help me find a new way to use up at least one of the food items below and I’ll send you the coupon code I received at the BlogHer ’13 conference to save 50% off fall planted bulbs at Longfield Gardens. I’d still love your recipe suggestions to help me clean out my pantry! 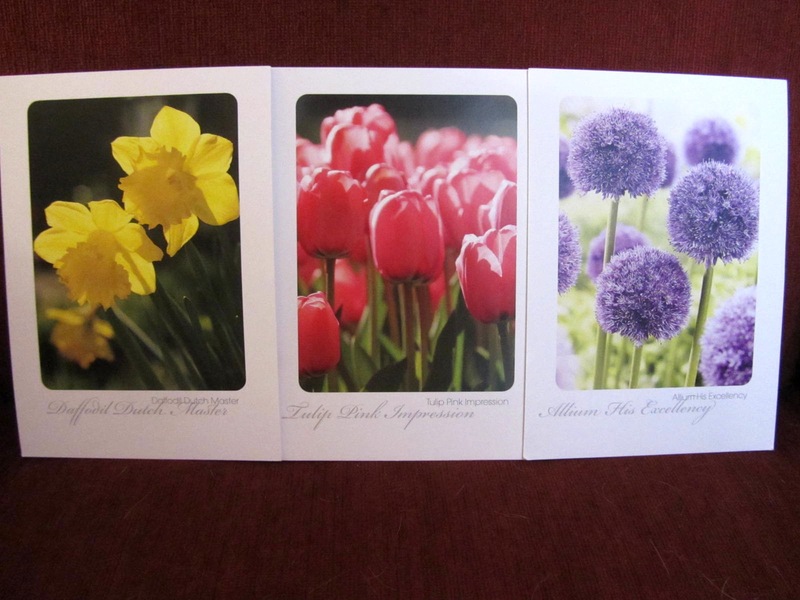 Thanks Jennifer for adding the first comment/entry to my recipe/fall bulb giveaway! This recipe looks really interesting. I’ve never tried mustard greens and this looks like the perfect way to try them out. I don’t like jalepenos but I could easily get some tomatoes without them and just add a little spice from the pantry spice rack. I might even try it with fresh tomatoes. Will definitely check this one out! I have to check this one out. I read a while ago that Alton Brown put sardines as one of his top foods for eating healthy, so I bought a tin. Haven’t been able to convince myself to try then yet..but your recipe may just get me there! If it were me, I’d make a bean and barley soup. A recipe? Hmmm. In a medium stock pot, saute diced carrots (1), celery (1), and onion (1). Season with salt and pepper. Saute until onions are soft. Add 2-3 cloves of chopped garlic. Once the garlic becomes fragrant, add a couple tablespoons of flour. Stir and saute for another minute. Add 3-4 cups of chicken stock, beans, barley, and a bay leaf. Bring to a boil, cover, and simmer for 30-45 minutes or so. Remove the bay leaf. Serve with your stale pita: chop them up into triangles (kind of like tortilla chips), saute in olive oil until their slightly soft or toasty, depending on how you like them. Love this idea. I don’t do celery (yuck! ), but the rest of it sounds great. And I’m due to make a batch of homemade veggie stock so then I’m all set for this recipe! I decided to change the giveaway so that EVERYONE who offers me a recipe suggestion for my listed ingredients gets the coupon code. No deadline other than the coupon is good through December 31. So share this post with your friends and you can all get 50% off of fall bulbs while helping me collect some great recipes!